Gliding through the shallow waters of the lagoon, our motorboat cut through a floating island of purple water hyacinths before coming to a sudden stop. In the distance, we could hear the loud squawking of a southern screamer. We scanned the sprawling floral carpet of blooming vines and water plants for life. Just as Tony leaned over to photograph a baby caiman hiding between the flower petals, our guide Javier pointed at a set of giant antlers peeking out from behind a tuft of tall reeds. 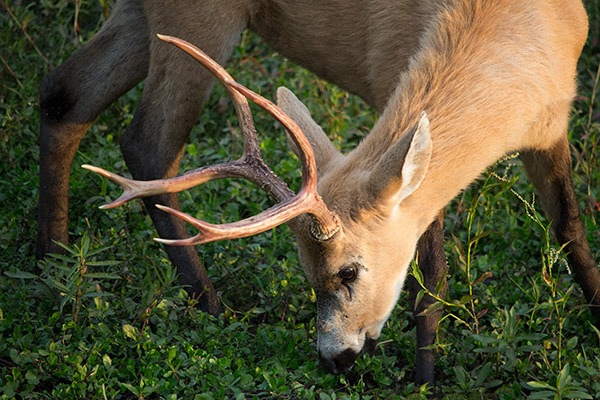 The marsh deer moved quietly along the shore, its orangish fur glowing in the morning sun. 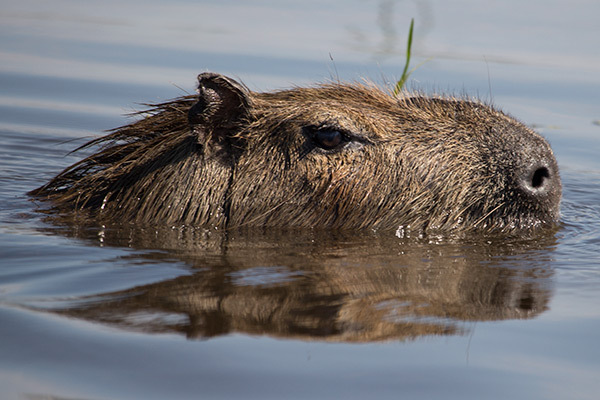 As Javier pushed the boat back with a paddle, a capybara sprang up from its hiding place and stared us down as we drifted away deeper into the watery wilderness. 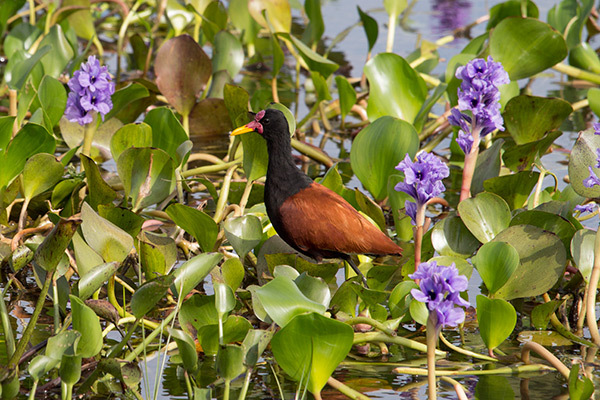 The Iberá Wetlands, which spreads across the northeastern corner of Argentina, is a mix of dense marshes, stagnant lakes, jungle-covered islands, palm-studded plains and shallow lagoons. 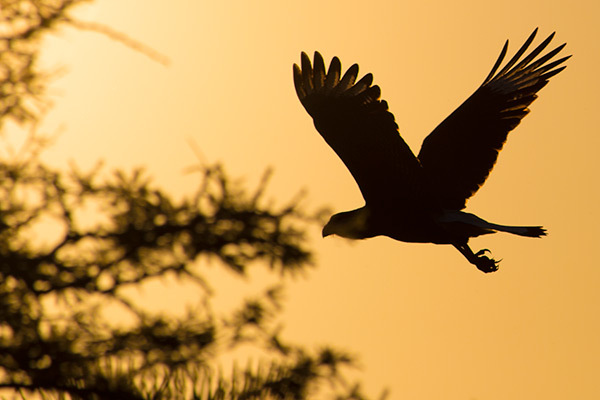 Home to a staggering variety of animals, the region boasts over 350 bird species, 125 fish species, and 1,400 plant species as well as a large number of mammals and reptiles. The area should be crawling with naturalists and wildlife lovers, but strangely it isn’t. The question is: why? The relatively small number of foreign visitors is certainly not for lack of size. 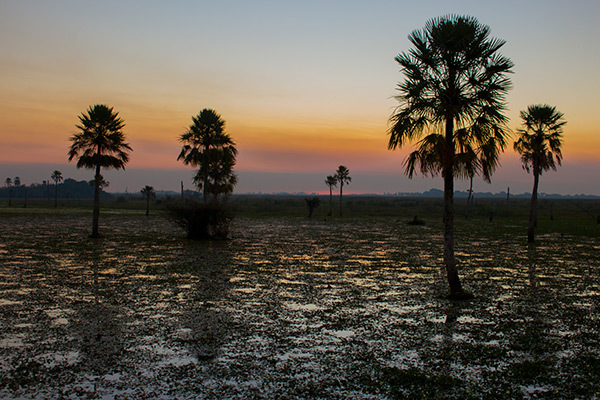 The Iberá Reserve is the largest protected area in Argentina and the second largest wetlands in the world after the Pantanal in Brazil. To put that into perspective, it covers an area about the size of Connecticut. That’s huge! 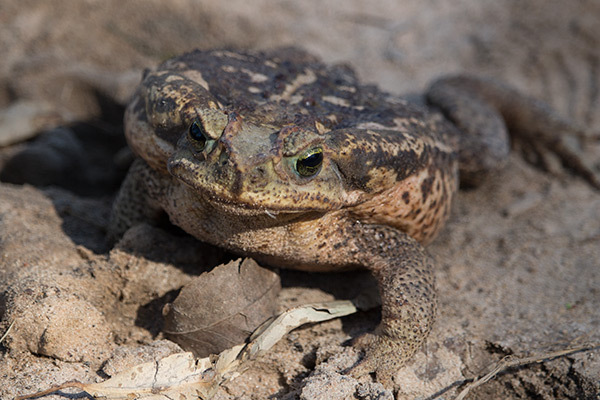 Perhaps, it’s the 800-km odyssey from Buenos Aires to the wetlands that scares visitors off. In our opinion, it shouldn’t. Travelers who make it to the small town of Colonia Carlos Pellegrini, the base for exploring this wildlife haven, are definitely rewarded for their efforts. But it’s not just spectacular nature that awaits explorers who venture off the beaten path. 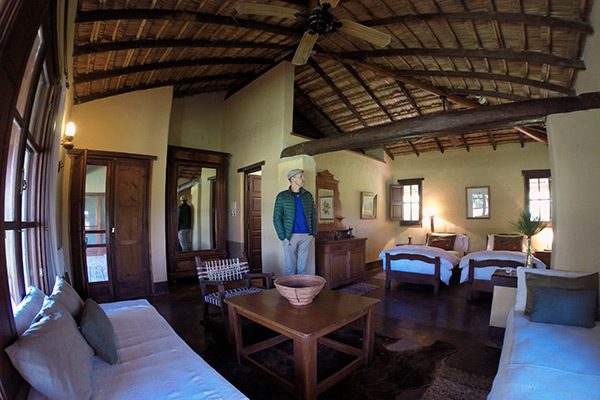 While the wildlife and wetlands environment are the main attractions, a fabulous lodge can take your visit to another level. Rather than roughing it, Tony and I decided to pamper ourselves with a stay at the luxurious Rancho de los Esteros which included half board and excursions. 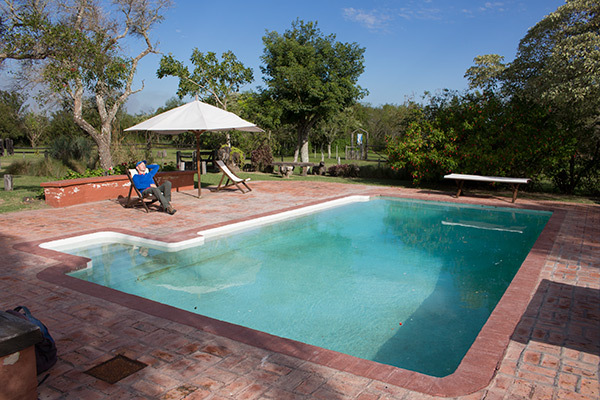 The gorgeous ranch home with its spacious, elegant guest cottages is situated on the shores of Iberá Lagoon. The sprawling compound is an oasis of tranquility. From the cozy sitting area of our stuccoed ranch bungalow, we had great views of the manicured lawn, the flowers, the gnarled trees and palms as well as the pool and the lagoon beyond. And even in the ranch grounds, we weren’t far from wildlife. Birds were everywhere. Small parakeets darted over our heads and red-headed cardinals pecked at the grass in search of food. 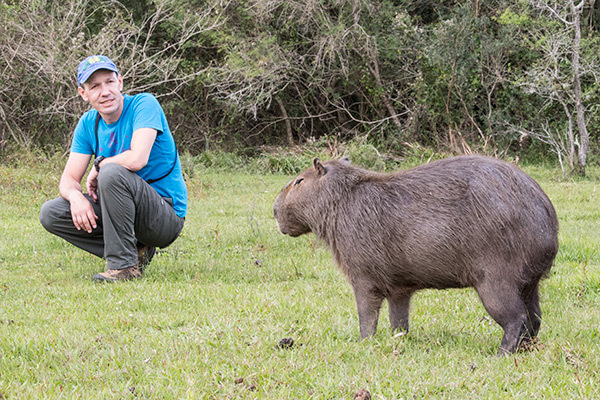 On several occasions, we watched large capybara families foraging close to the ranch’s pier. 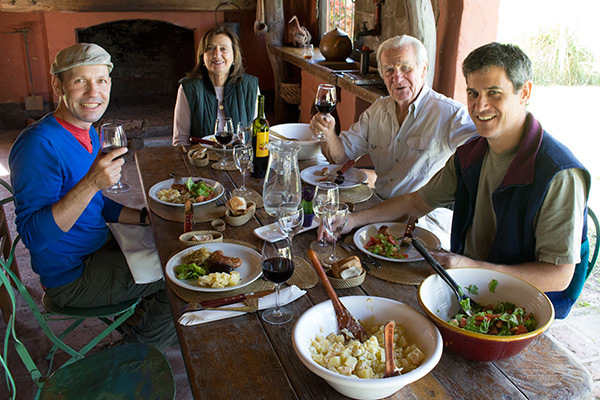 Rancho de los Esteros is a little piece of paradise – a paradise made even better thanks to our wonderful hosts Maita and Julio. 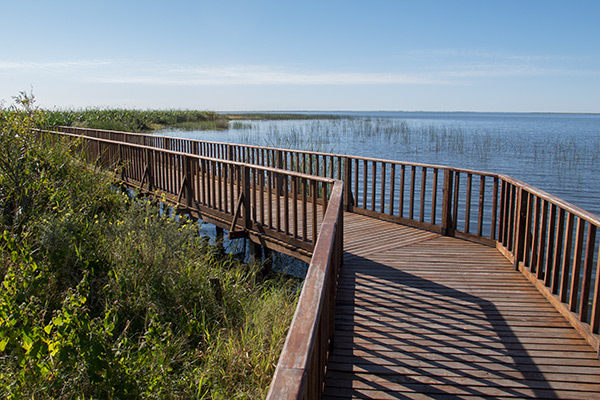 The welcoming Argentinian couple moved from Buenos Aires to the Iberá Wetlands over a decade ago to turn a new page and connect to nature. Their passion for their new-found environment is obvious. It shows in the natural building materials they use for their bungalows and in the way they talk about their now simpler life in the wetlands. They love conversation and entertaining their guests – and they make a killer BBQ! 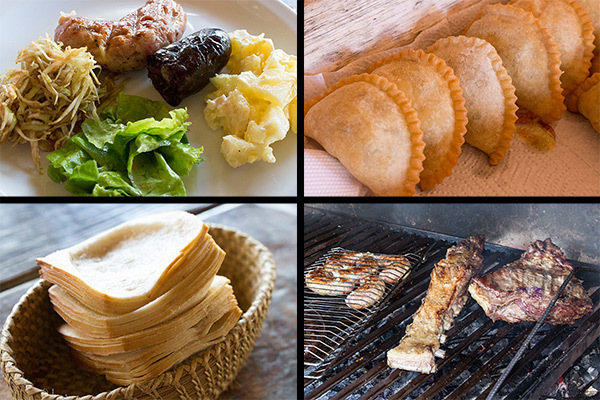 Over mouth-watering grilled meats, delicious salads, and amazing empanadas, Tony and I sat with Maita, Julio and his son Federico and talked about life. Julio happily chatted about his German heritage and impressed us with some German he remembered from his childhood. It was easy to forget time and the reason why we had come here in the first place. 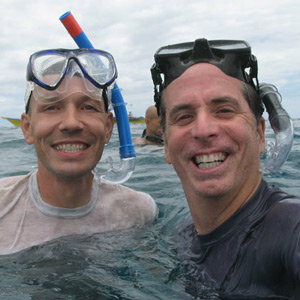 As part of our package, Maita and Julio organized a couple of motorboat outings into the lagoon. 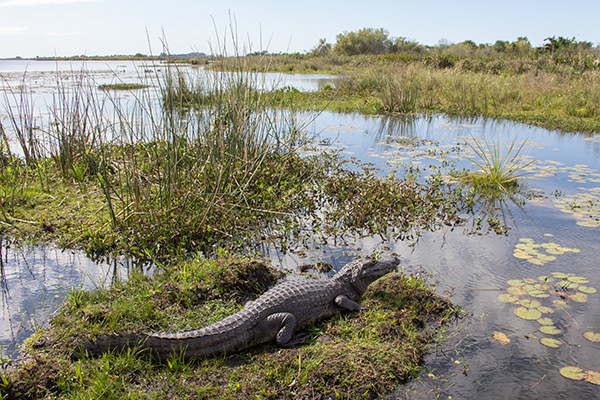 For most visitors, this is the primary way of exploring the wetlands. 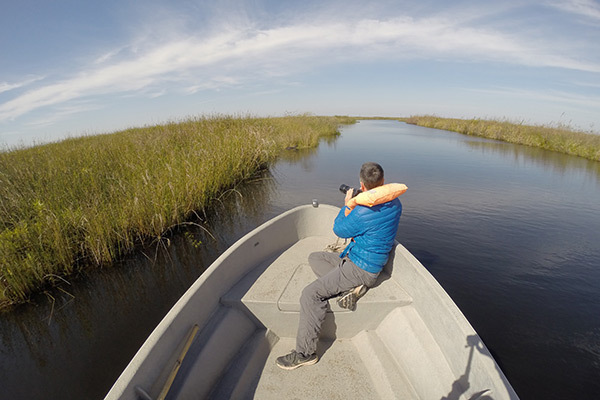 The water tour usually follows the shoreline of the lagoon and ventures into an interconnected maze of shallow lakes, narrow creeks, flowering marshes and backwater channels. Wildlife viewing from the water is excellent. Boats can approach the animals to within a couple of meters without scaring them off. Maita and Julio went way out of their way to make our visit a true adventure. Seeing the excitement in our faces, they suggested a backcountry excursion in Julio’s four-wheel drive. We didn’t need much convincing. We were immediately up for off-road exploration into the wilderness. 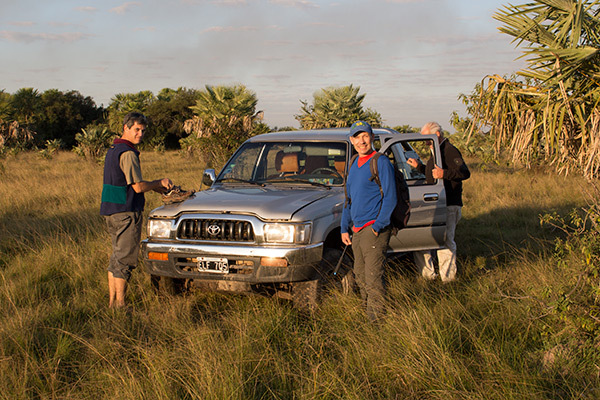 Bouncing up and down on the backseat of the Toyota, we watched Julio maneuver the rough dirt roads like a pro. A caracara took to the air swooping directly past the windshield as we rattled by the fence post where it had been perched. After passing through a crumbling ranch gate, the dirt track disappeared completely. 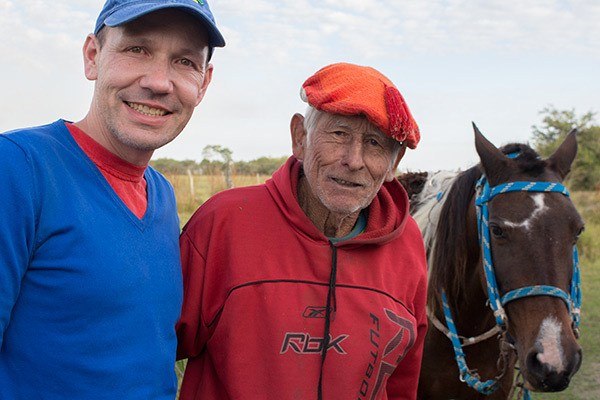 Suddenly, out of nowhere, an old-school gaucho emerged and greeted Julio and his son like old friends. While the three men chatted away in rapid-fire Spanish, Tony and I let our eyes wander over the vast grasslands. In the distance, a couple of brown-and-white flecked cows eyed us suspiciously. We said our adioses to the cowboy in his traditional, knitted cap and continued our bumpy ride. As the solid pastures turned into spongy grasslands, the tires spun out spraying the area behind us with a carpet of muck. This was as far as we could go. We climbed out of the car and jumped from one dry patch to another until we reached the tall reeds on the shores of the lagoon. With the exception of the rustling of pindo palms, the air was filled with silence. As we looked around the unique landscape of dry forests, swamps, pastures, and palm-tree-studded marshes, we continued to ask ourselves why the region wasn’t a household name on everyone’s bucket list. Guided boat trips and off-the-track car tours are a great way to explore the wetlands, but for those eager to get up close and personal with the wildlife, you just can’t beat walking. Luckily, the Argentinian national reserve system gets that. From the small nature interpretation center, we followed a wooden arrow that pointed us in the direction of the Montes Trail. I walked ahead of Tony through a patch of dry forest and popped out in a grassy field that lead to the lagoon. 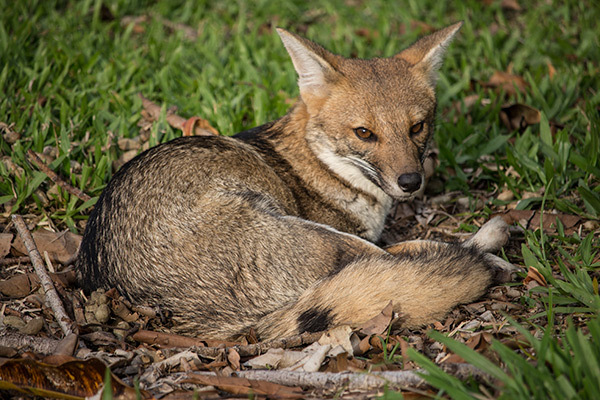 A large Martin kingfisher was perched on a stump rising out of the reeds and a gray fox lay curled up in the short grass just ahead. From an elevated hide at the end of the trail, I watched a dozen capybaras. Some foraged for aquatic plants in the lagoon, others lay sprawled out in the sun at the edge of the forest. Tony moved slowly between the animals snapping pictures and taking in the natural spectacle. Suddenly, he stopped and pointed at a small orange-brown cat with distinct black markings. 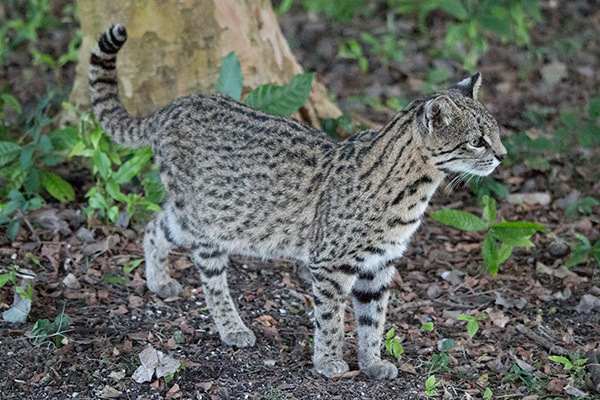 I immediately remembered seeing the picture of a Geoffroy’s cat in the visitor’s center. Wow, our fifth wild cat sighting in Latin America! I jumped down from the hide and quickly caught up with Tony who was already checking out our little friend. Rather than taking off, the cat meandered alongside us for about ten minutes and then disappeared into the bushes. And this wasn’t the only surprise discovery of the day. 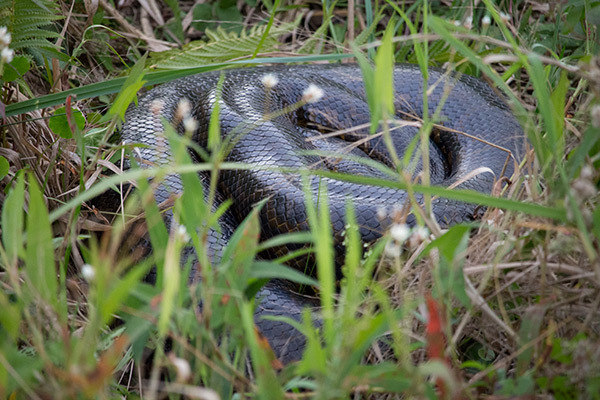 As we stepped onto the elevated wooden walkway behind the visitor’s center, Tony noticed a large black snake curled up in the grass near the center. I excitedly ran over to one of the guides who followed me back to the walkway and identified the reptile as a yellow anaconda. Apparently, the humongous snake frequently hangs out in the area. Just amazing! We pushed further along the elevated trail and spotted marsh deer, black caimans, gray brocket deer, and capybaras. Across the road from the visitor center, the Caraya Trail leads through a forested area where visitors hope to see black howler monkeys. Unfortunately, the reserve was doing construction on the trail during our visit, so we didn’t see or hear any howlers on the trail. I’m sure howlers aren’t great fans of hammers and saws. But never fear, as we were walking away from the trail back towards the town, we spotted a large neotropical river otter. Yay! The experience in the wetlands embraces everything from wildlife to extraordinary landscapes to Spanish and Guarani ranch life. To get one last intimate glimpse of the wetlands, we took the ranch’s kayaks for a spin. Quietly paddling through the tall reeds, I instinctively ducked to avoid the sharp blades about to graze my face. 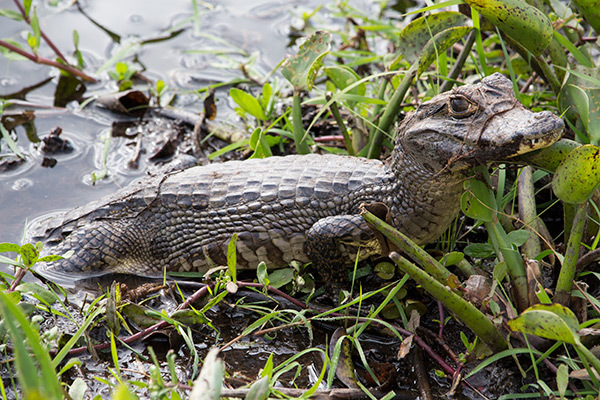 Suddenly, I heard splashing next to me and saw the tail of a caiman disappear into the depths. Tony leaned over the side photographing a capybara family cutting through the waters, their faces reflected on the mirror-like surface. One of the young had climbed on its mother’s back to rest while its siblings were struggling to catch up. What a National Geographic moment! I felt exceptionally lucky to be here and to experience this moment – and I could see on Tony’s face that he did too. We highly recommend a visit to the extraordinary Iberá Wetlands to anyone who loves nature and is looking for a world-class wildlife experience. 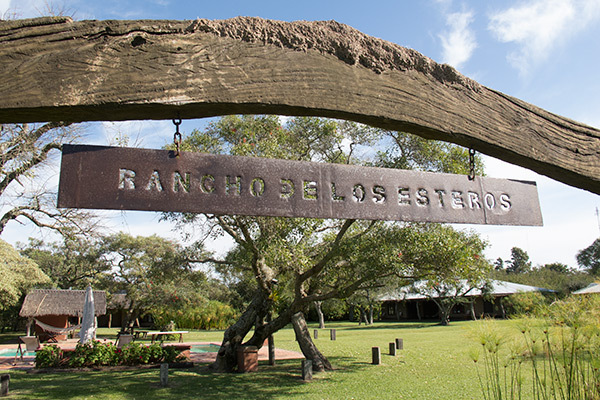 If you would like to find out more about staying at Rancho de los Esteros or you want to take a look at their their offerings, visit them at www.ranchodelosesteros.com.ar/. Depending on where you are in Argentina, getting to Colonia Carlos Pellegrini takes commitment. 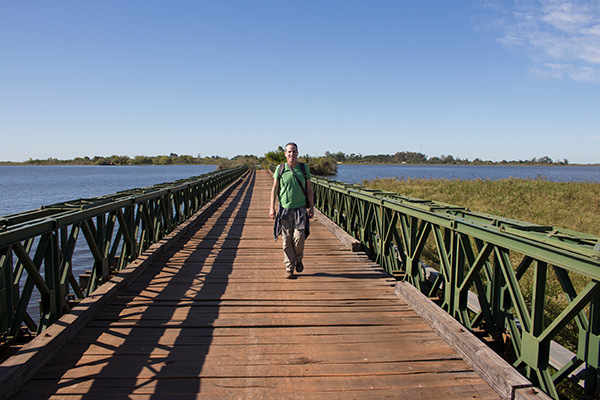 If it weren’t for the bad roads and the awkward connections, Esteros del Iberá would be the perfect stopover between Buenos Aires and Iguazú Waterfalls in the northeastern tip of the country. While there’s a direct connection from Colonia Pellegrini via Posadas to Puerto Iguazú, this route depends on the weather and on how much you are willing to pay. Going from Buenos Aires to Colonia Pellegrini is long but relatively straight forward. We went by overnight bus to Mercedes (9-10 hours) and took a shared taxi to Colonia Pellegrini. The 3-hour trip started on a paved road which soon turned into dirt. Luckily, the 120-km drive is like a mini-safari. 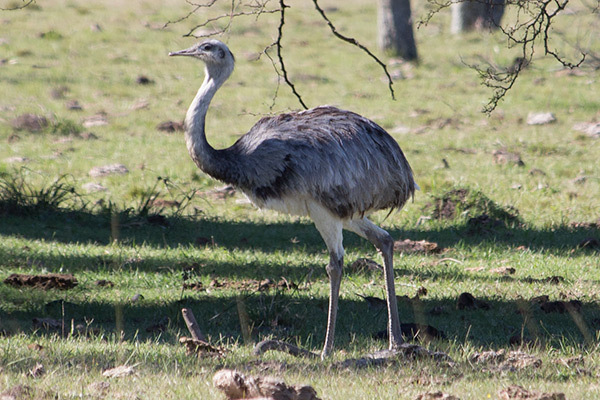 We saw tons of capybaras and ostrich-like nandus (greater rheas) on the way. While there is a dirt road to Posadas from where you can easily catch a bus to Puerto Iguazú, getting to Posadas is a bit tricky. There is no public transportation. You have to search for a private car and be willing to pay as much as US$150 per vehicle. Sometimes, you find a group to share the costs. However, connecting to other travelers is not easy, as Colonia Pellegrini is quite spread out. I had hoped for a centralized transport hub in town, but there was nothing. If you are lucky to find a group and transportation, the weather also has to play its part. Rain turns the dirt road into a mud river. This means no trip if it rains the day before or on the day of departure. We couldn’t manage to find a car the day we wanted to leave, so we went the long way around to Iguazú Falls. We went back to Mercedes by shared taxi and took a bus to Corrientes where we stayed the night. From there, we connected to Puerto Iguazú via San Ignacio where we checked out the ruins of the mission San Ignacio Miní. 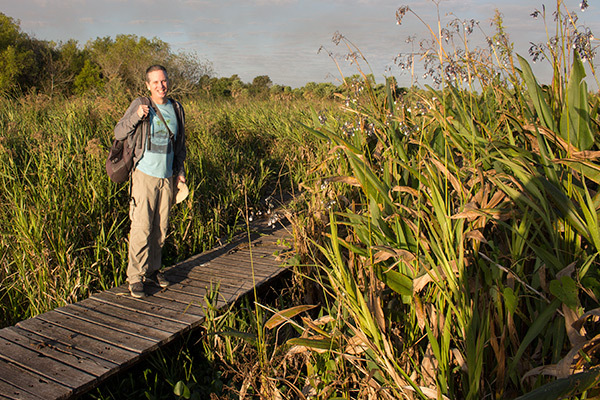 Disclosure: We were guests of Rancho de los Esteros while exploring the Iberá Wetlands. However, all of the opinions expressed here are our own. Have you guys been to the Pantanal too? I was just wondering how it compares. Katie, No we have not been to the Pantanal. I think there are far fewer visitors to the Ibera Wetlands and there is less tourism development in the region. There are no jaguars left in the Ibera Wetlands, which I think is a big draw in the Pantanal. The marsh deer is more common in Ibera. 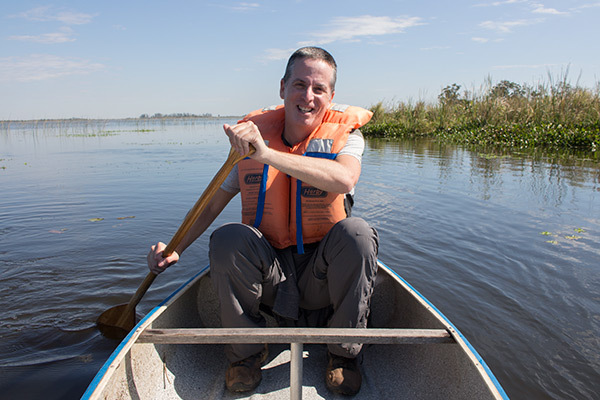 However, since we have not been to the Pantanal yet, we cannot compare the quality of the experiences. We are a bit limited on time and we are trying to decide between Ibera and Peninsula Valdes. Do you have any recommendations? Both are really great. It really depends on your interests, the rest of your itinerary, budget, and what time of year you will be visiting. Both destinations are a bit off the normal Argentina track. If you are traveling to or from Iguazu, Ibera will fit in better. If you are heading south (especially overland) Peninsula Valdes will fit in better. Honestly, both destinations are fantastic, so you really can’t make a mistake. However, I do warn you not to try to fit in too much when visiting these destination. You really don’t want to have to rush through. @Judy: I agree with Tony. One thing I wanted to mention is the distance. Assuming you will travel from Buenos Aires, it’s 800 km (500 miles) to the Iberá Wetlands and 1,300 km (800 miles) to Puerto Madryn, your base for visiting Peninsula Valdes. Argentina is huge, so just make sure you plan in enough travel time. This sounds like a place I would really like but I am on a 12 month trip and I can not afford a lodge. Do you know if there is a hostel where in the town? Or can you camp somewhere in the park?